Real-time mobile P2P payments are helping take digital payments from millennials to mainstream. Boston, February 6, 2019 – Mobile person-to-person payments have become an increasingly important battleground for financial institutions, and tech giants are using mobile P2P payments to drive engagement with consumers and monetize other aspects of their businesses to drive revenue. Real-time payments, meanwhile, solve myriad problems for consumers and businesses alike, and they are helping to drive the adoption of mobile P2P payments in the U.S. 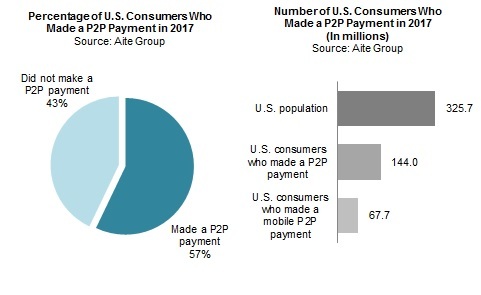 This Impact Note examines U.S. consumer awareness of and demand for real-time P2P payments. It is based on two quantitative online studies: a Q4 2017 survey commissioned by Visa Inc. of 2,078 U.S. consumers age 18 or older who received funds disbursements from October 2016 to September 2017 and a Q2 2018 Aite Group study of 2,538 U.S. consumers age 18 or older who received funds disbursements from June 2017 to May 2018. This 23-page Impact Note contains 19 figures and one table. Clients of Aite Group’s Retail Banking & Payments service can download this report, the corresponding charts, and the Executive Impact Deck. This report mentions Apple, Amazon, Facebook, Google, Mastercard, PayPal, Square, Venmo, Visa, and Zelle.